Nativa en Colombia; Alt. 0 - 700 m.; Andes, Pacífico, Valle del Magdalena. Disk 0.3–0.4 mm high, fleshy, glabrous Disk 0.3–0.4 mm high, fleshy, glabrous. Ovary 1. 5 × 1 mm, ellipsoid, glabrous. Fruit yellow or orange when ripe, with a gynobase 0.4–0.5 mm long on the invaginated base of the drooping to pendulous calyx, 7–8 mm in diameter, ± globose, often capitate-glandular Fruit yellow or orange when ripe, with a gynobase 0.4–0.5 mm long on the invaginated base of the drooping to pendulous calyx, 7–8 mm in diameter, ± globose, often capitate-glandular. Seeds yellowish, 1. 8 mm across, ± orbicular in outline, reticulate-foveate Seeds yellowish, 1.8 mm across, ± orbicular in outline, reticulate-foveate. Chromosome number: 2n=24 The specimen Descamps s.n., from Malawi (S: Blantyre), referred to P. pubescens by C.H. Wright, loc. cit. (1906), and by Binns, loc. cit. (1968), was not seen by me. Now widely naturalized in the tropical and subtropical regions. A weed of cultivation and disturbed ground, sometimes cultivated for its edible fruits. Common name: “Strawberry Tomato”. Erect to procumbent or prostrate, usually slender and diffusely much branched, annual herb, said to reach 2 m, probably much less in the Flora Zambesiaca area, sometimes tinged purple, ± viscid, ± densely clothed with simple, fine, usually multicellular, greyish, whitish or hyaline, spreading, eglandular hairs, sometimes also glandular hairs of varying size, rarely subglabrous, furnished with ± sessile glands too. Flowers solitary, axillary, erect to pendulous; pedicel 3–4(5) mm long, densely pubescent-villous, in fruit elongated to 7(8) mm. Flowers solitary, axillary, erect to pendulous. Ovary 1.5 × 1 mm, ellipsoid, glabrous; style 3 mm long, filiform, straight. Flowers yellow with brown centre. Alabama, Argentina Northeast, Argentina Northwest, Arizona, Aruba, Bahamas, Belize, Bolivia, Brazil North, Brazil Northeast, Brazil South, Brazil Southeast, Brazil West-Central, Colombia, Costa Rica, Cuba, Dominican Republic, El Salvador, French Guiana, Galápagos, Guatemala, Guyana, Haiti, Honduras, Jamaica, Kentucky, Leeward Is., Mexico Central, Mexico Gulf, Mexico Northeast, Mexico Northwest, Mexico Southeast, Mexico Southwest, Netherlands Antilles, New Mexico, Nicaragua, Panamá, Paraguay, Peru, Puerto Rico, Suriname, Tennessee, Trinidad-Tobago, Uruguay, Venezuela, Windward Is. Physalis pubescens var. integrifolia (Dunal) Waterf. 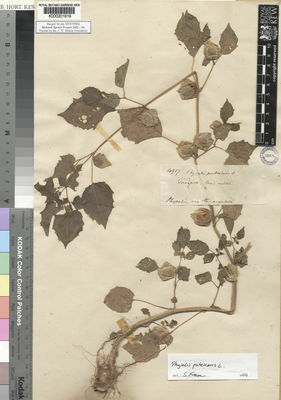 Physalis barbadensis var. obscura (Michx.) Rydb. Waterfall in Rhodora 60: 164, for discussion. Garcia de Orta 17: 281, 282 (1969). Robyns, Fl. Sperm. Parc Nat. Alb. 2: 205 (1947). T. & H. Durand, Syll. Fl. Congol. : 396 (1909) pro parte saltem excl. syn. P. barbadensis Jacq. F.T.A. 4, 2: 247 (1906) pro parte saltem excl. syn. P. barbadensis Jacq. A. de Candolle, Prodr. 13, 1: 446 (1852).